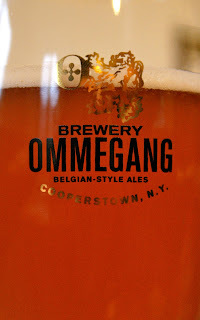 catholicbeer: Beer Tasting Monday - Ommegang: "Ommegeddon"
Beer Tasting Monday - Ommegang: "Ommegeddon"
The Zealot and I cracked open a bottle of Ommegeddon last night. We have been trying beers lately which have used Brettonmyces and personally I think I am in love. Brian was a little surprised by the beer as you can kinda tell from the video below, but it kept impressing me throughout the tasting just how robust and rich the flavor was (I think I mentioned truffles or mushrooms like 5 times.. ha!). For those of you who are not familiar, Ommegang is a brewery opened up in the US, by the owners of Brouwerij Duvel Moortgat. That makes it the closest thing to a Belgian brewery here in the states without actually being from Belgium (sorry New Belgium Brewery...). This particular beer Ommegeddon, is a "Brett" beer with the subtext "Funkhouse Ale with Brettonmyces." I really think I may be doing a batch of "brett" myself soon especially considering the last two beers that I have had which used the stuff: Boulevard Brewing's "Saison Brett," and this one. All in all I give this beer very high marks for balance and digestibility. Don't go pulling this one out when you need a malty trappist brew... more of a dry, deep earthiness which would lend itself nicely to a nice big basket of moules et frites. I'll have to try this one, firshizzle. LOVE that you have video on here. Praise be to beer, it deserves such heartfelt passion and technology.